We’re proud to announce our newest sound library: GORE! Clocking in at 875+ files, this library has all the great bloody impacts, guts, gore, and weapon impacts that you can think of! You can never have enough gore to add to your collection! 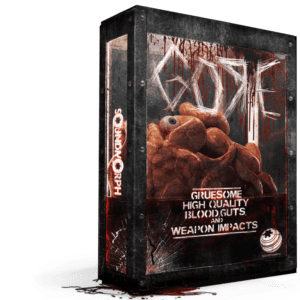 Gore is just plain & simple great high-quality bloody impacts, splatters, and weapons. You can’t go wrong with this library, and it will be a workhorse go to for many years! Just look at the list below or download the PDF excel sheet to get an idea of all that you get. GORE features more than 875 files, 2.92 GB of 24bit/96khz .WAV files, all meticulously embedded with Soundminer and Basehead metadata. GORE was created in collaboration with Michael Leaning, a UK based Triple AAA video game sound designer.